We’ve stopped by Mitchell Johnson’s studio a number of times since first meeting him in 2010, but were overdue for a longer visit to learn what he’s been up to in the last few years. 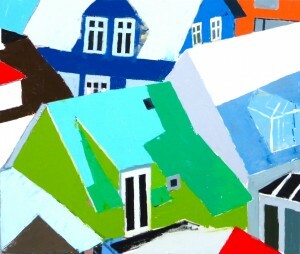 The Menlo Park-based artist told us that he’d recently returned from Reykjavik, Iceland, and had already sold one of the rooftop paintings (pictured below) that resulted from that trip. We wanted to know more about his affinity for roofs. Mitchell also has a new hardback book coming out, featuring 200 paintings from the last four to five years. It was done in advance of a solo exhibit of his works at the Bakersfield Museum of Art in 2015. Titled Mitchell Johnson: Color as Content (2014) , it features commentary by, among others, Alexander Nemerov, who is Professor of Art and Art History at Stanford University. “I was fortunate to meet him at the ground breaking for the new Anderson Museum on campus,” he said. In addition to commentary by Nemerov and others, the book features interviews and reproductions of other artists’ works. Please let me know about any upcoming exhibitions in New York City. Thanks! No plans for shows in NYC, just shows in the NY Times Style Magazine. Watch for the next appearance in October! My new book, Color as Content, is finally available at Amazon.